As the launch editor of Panini UK’s Collector’s Editions, it was important to hit the ground running and select the best starting point from Marvel’s illustrious history for each title. 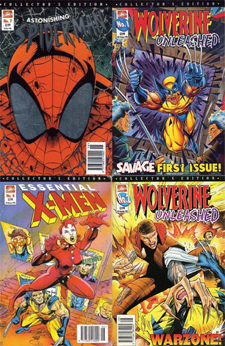 The series was launched with Astonishing Spider-Man and Essential X-Men, and quickly joined by Wolverine Unleashed. As well as reprinting classic strips, we managed to sneak a few interviews with top creators inside and some covers from future Marvel megastars Jim Cheung and Andrew Currie (who also managed to sneak our old Deadline character Kilkane onto the cover).